“It’s only a matter of time until a silenced round injures or kills an innocent person who had no opportunity to hear the report of gunfire and find cover,” warned Ladd Everitt, spokesman for the Coalition to Stop Gun Violence. 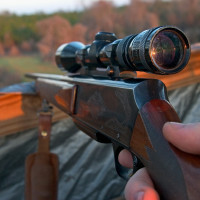 Bullets fired from a typical hunting rifle are moving anywhere from two to three times the speed of sound. A person in the path of a hunter’s bullet is going to be hit by the bullet before they hear the shot. At that point I don’t think it will much matter to them whether the report they hear is full or muffled. This isn’t like Star Trek the Next Generation where you have a pretty good chance to duck out of the way of a fired phaser. Aside from this one ridiculous argument, a lot of anti-gun people are ignoring the fact that hearing is a two way street, and a hunter who does not need to wear hearing protection, and hasn’t been deafened by gunfire, stands a much better chance of hearing people nearby before taking a shot. I think it’s not so much the intended target ducking but the people around the target ducking before the next round comes in. Of course this misses the fact that anything outside of subsonic .22 will likely still be heard and recognized as gunfire in any situation where a deranged killer is set on a body count. Any bullet traveling supersonic (1100 fps I think) is gonna create a small sonic boom as it travels. that cannot be avoided without using subsonic ammo. I agree. As rock-brained as Ladd is, I don’t think he meant ducking THE round, he probably meant hearing A round and hiding from later rounds. At 53, even being careful and wearing some kind of hearing protection when target shooting (cigarette butts on a few occasions..) I’ve got tinnitus in both ears and hearing loss in my left ear. A suppressor on my hunting guns would have probably kept it from happening. But enough about black powder shooters…. Wow, this guy really lacks a basic understanding of 8th grade science. Amazing. It is no coincidence that many of the Framers were professional or amateur scientists (Ben Franklin, the Ritttenhouse brothers, Thomas Jefferson, Benjamin Rush). I’m sure everything Mr. Everitt knows about sppressors he learned from movies. (To be fair, given the faulty belief that suppressors make guns “very quiet”, he has a point – in that the first shot won’t alert you to take cover, the way you would from a normal gunshot that missed you. I mean, he’s wrong, because his belief about suppressors is apparently wrong, but he’s wrong in a different way, I think, than “not realizing that bullets are supersonic”. Though to the extent he might believe that, I also blame movies, for always showing people ducking after they hear a shot … and sometimes showing it hitting afterwards. Handguns were all subsonic before smokeless powder I believe, not sure about BP rifles…. My family visited the Churchill museum in Fulton, MO ( where he gave his famous “Iron Curtain” speech in ’46). In a panel of the exhibit, a comrade recalled they were being shot at (I forget which war) and he kept ducking, Churchill didn’t. “By the time you hear them they’re already past you,” he explained.